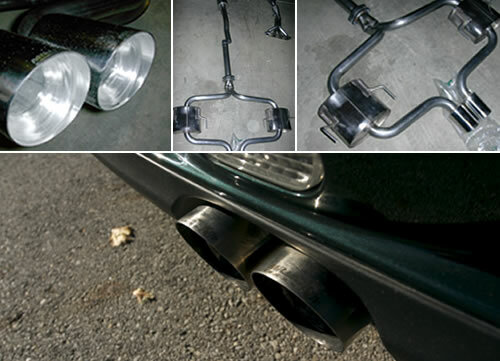 This Miltek Exhaust: R52S/R53S is a stunningly clean design with results to back it up. Dual round slash tips fill out the rear nicely and look like business. Built very much like the Magnaflow in that the whole back end is one large part all welded together which connects to a mid and front pipe which then bolts directly to the stock header flange. No welding needed. I had one of these on my personal Gen 1 Cooper S for about 2 years and absolutely loved it. It's a bit louder than the Alta (barely), but not near as loud as the Magnaflow or the Borla Race. At idle, it has a nice smooth growl and at full throttle it sounds very mature and refined. Highway cruising noise is minimal with NO reverberation=no headaches. This won't wake the neighbors either but it does sound good. Each system has its own serial number plate welded on to confirm it's a real MILTEK. Imported from the UK. Straightforward install. Available as a resonated (will not wake the neighbors) and a NON-resonated (will possibly lead to some interesting conversations at the mailbox).